Conquest was a collectable series for Warhammer 40,000, where each month you would receive a clutch of issues that let you build armies of Primaris and Plague Marines. After much delay, this series is finally coming to Australia. With 80 issues at $19.99 each, you’re looking at roughly $1,600 to complete the set, so this one is for the fanatics only! The complete list of what you get per issue is availabel via Sprues and Brews. The subscription page is here, and right now you can start your collection from any of the first 4 issues. Well, I guess spreading the pain around is the best way to hook more people. But my goodness, if that is a monthly thing, you’re talking 6 1/2 years to complete it? I can’t see many people having the patience for that! And I just looked at the sub page. $80 a month? wow, that is EXPENSIVE…..
You get 4 issues in each monthly delivery, so it’s 80 weeks rather than 80 months. Still, though. Thanks for the heads-up Dave. Unfortunately it’s a bit rich per issue for a lot of them, and only worthwhile for every few by the look of things. At $20 a pop (and not available simply from local newsagents) with a few too many issues just containing 1-2 paints, I’m probably going to have to pass. 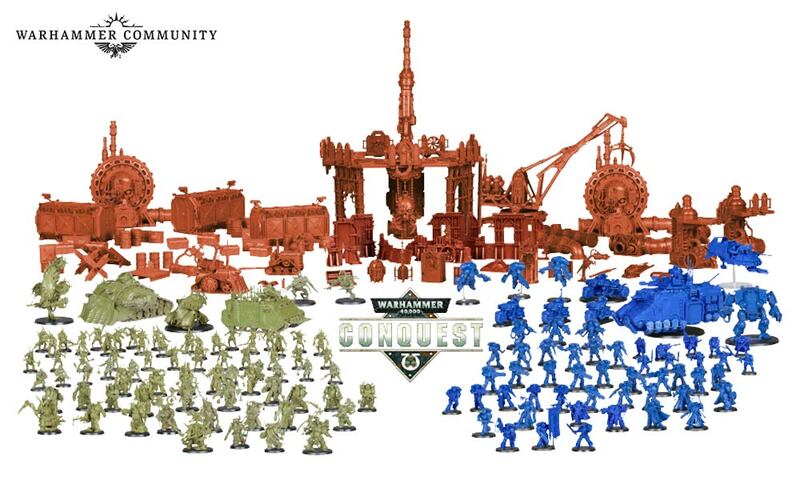 This entry was posted on March 23, 2019 by davekay in Industry, Miniatures, Tabletop and tagged australia, conquest of power, hachette, warhammer 40k.